Tanabe Medalion Exhaust - Concept G - Lightning Motorsports - Selling Speed since 1996 ! CONCEPT G is an all new motorsports developed exhaust system that features high power benefits, while maintaining responsible sound levels. 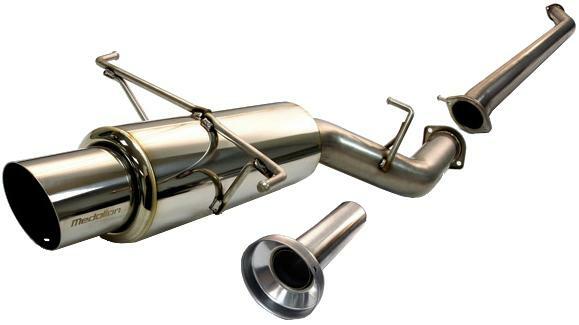 Using the all new ‘continuous strand’ ADVANTEX packing material technology, CONCEPT G acheives extremely high levels of exhaust system efficiency, while maintaining a street driveable, extremely clean sound output that is under 93db. This system requires no removeable silencer for under 93db operation at all rpms, and produces a unique, deep tone and rumble. The full SUS304 stainless CONCEPT G is designed for optimal pipe routing as well as ground clearance. It’s sporty appearance and angle-cut tip is ideal for the sports car & sport compact driver. Engineered for sports car & sport compact performance.